Brett McCormick leads the Superbike field on the opening lap at AMP. SHUBENACADIE, N.S. (August 7) – Brett McCormick edged a step closer to his first Canadian Superbike Championship by Parts Canada national title by taking his fifth win of the season at Atlantic Motorsport Park on Sunday. The Saskatoon rider led all 22 laps of the 2.56km AMP circuit on his radX / BMW Motorrad Canada BMW S1000RR, finishing the race in 25 minutes, 8.591 seconds for an average speed of 134.398 km/h. Five-time defending series champion Jordan Szoke of Brantford, Ont. placed second aboard the Competition Systems Kawasaki Race Team Kawasaki ZX-10R, 5.829 secs. behind McCormick, and Jodi Christie of Keene, Ont. completed the podium riding the Jodi Christie Racing / Cameron Cycle / Blue Streak Racing Honda CBR600RR. The win kept McCormick’s perfect season intact and gave him a 55-point lead over Szoke heading into the season ending doubleheader at Mosport International Raceway in two weeks. A race win is worth 50 points. 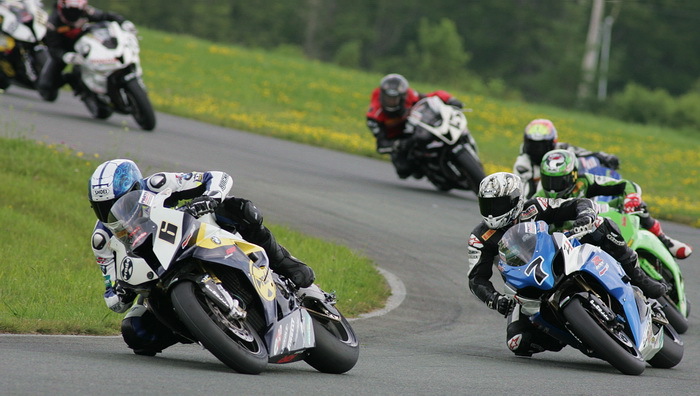 Brett McCormick leads Jordan Szoke early in Sunday's Superbike final in Nova Scotia. McCormick stormed into the lead from second on the grid off the start and was able to open a slight gap to Szoke after five laps. His only tense moment came on the final lap, when he and the Wolf BMW S1000RR of Rob Busby made slight contact while Busby was being lapped on the backstraight. “I got a bit of luck back there on the last lap,” McCormick admitted. Szoke was third off the line but grabbed second from the Z1 Cycletech / Kenwood Suzuki GSX-R1000 of Uxbridge, Ont.’s Alex Welsh before the end of the opening lap. The winner of the Kawasaki S4-R Competition Lubricants Pole Award on Saturday was unable to challenge McCormick, however. Christie came out on top of a wild battle for third with Welsh and the Suzuki Canada / Hindle / Sturgess Cycle Suzuki GSX-R600 of Woodbridge, Ont.’s Frank Trombino. The Honda rider got around Trombino entering the Carousel near the end of lap 10 and then took third from Welsh at the same spot four laps later. Alex Welsh (7) takes over the Pro Sport Bike race lead chased by Edie and Christie while Trombino's motorcycle rolls through the grass in the background. Welsh was fourth, right behind Christie at the line and Trombino settled for fifth. Michael Ferreira of Mississauga, Ont. placed sixth on his radX / BMW Motorrad Canada BMW S1000RR and moved into a tie for third in the Canadian Superbike Championship by Parts Canada standings with Andrew Nelson of Kars, Ont., who was 13th after a first lap incident on his Nelson Racing / GymMax / Monette Sports BMW. They both have 155 points heading into the season-ending Mosport doubleheader. Christie extended his lead in the Pirelli Pro Sport Bike Championship standings by scoring his second win of the year at AMP on Sunday. The Honda rider passed Welsh in turn two on lap nine of the 18-lap race and went on to score a 4.027-sec. victory over the Suzuki GSX-R600 rider. Rookie Pro Bodhi Edie of Warman, Sask. finished third on the Edie Racing / Acceleration Racing / Honda Canada Honda CBR600RR. Christie now leads Welsh by 24 points in the standings, 237-213.Trombino sits third with 165 points after crashing out of the lead on lap seven. Steve Crevier of Maple Ridge, B.C. claimed his fourth straight win in the Harley-Davidson XR1200 Cup. The rider of the MotoSport Plus of Kingston-backed entry finished 8.730 secs. ahead of the Deeley Harley-Davidson Canada / Ruthless Racing bike of North Vancouver’s Darren James. Bracebridge, Ont.’s Chris Harmon was third on his Vision Harley-Davidson machine and earned the Performance Under Gear Performer of the Race award for his effort. Crevier now leads the XR1200 Cup point standings by 61 points over Cochrane, Alta.’s Cody Matechuk, who finished 13th on Sunday after experiencing engine trouble with his Halifax-based Privateers Harley-Davidson entry. Kristopher Garvie of Caledon, Ont. opened up a 70-point lead in the Inside Motorcycles Amateur Sport Bike class by scoring his second straight victory of the year on the Tracksport Technologies / Kahuna Powersports Kawasaki ZX-6R. Samuel Proulx of Magog, Que. placed second riding the Sherbrooke Harley-Davidson Suzuki GSX-R600 and Toronto’s Edward Rudkowski took third riding another Suzuki GSX-R600. Paul Whitehead of Baddeck, N.S. won the rain-shortened K&N Performance Filters Amateur Superbike race on his Rampage Racing / DW Mathesons Honda CBR600RR. Jody Greening of Burlington, Ont. extended his points lead with a second place finish aboard the BFE / ProStar / Sturgess Cycle Honda CBR600RR and Caleb Noiles of Upper Cloverdale, N.B. 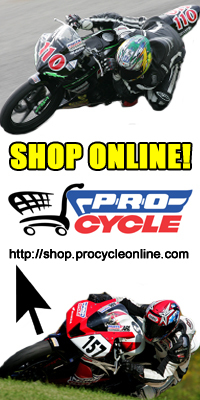 placed third on the Ayden Lee Racing / Pro Cycle Kawasaki ZX-6R. 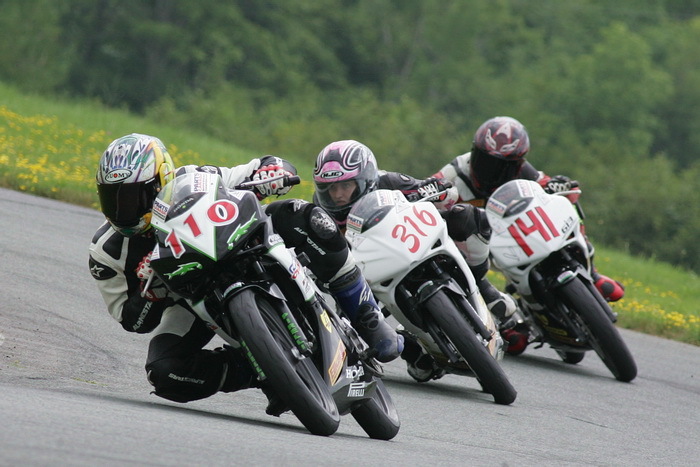 CBR125R Challenge race action from Shubenacadie. Stacey Nesbitt of St-Lazare, Que. won her second straight race in the Honda CBR125R Challenge and took over the class points lead after Falmouth, N.S. racer Austin Shaw-O’Leary was penalized for a jump start and relegated to third in the results. Nesbitt will take a three-point lead over Shaw-O’Leary to the final round at Mosport International Raceway in two weeks. Coverage of this weekend’s racing at Atlantic Motorsport Park will be shown later this year on radX HD as part of its Monday night block of motorcycle racing programming, ‘Parts Canada Motorcycle Mania’. The first show premiers on Nov. 7. Margin of Victory: 5.829 secs. Posted on August 7, 2011, in CSBK - Canadian Superbike Series. Bookmark the permalink. Leave a comment.